If you've got other people in your company who need to use your QuickBooks, you can add them and give them specific access. Next you’ll want to choose what kind of user you’ll be adding. Choose an appropriate user type from the options available. If the type you have in mind is not listed, select the first option for a Regular or custom user then click Next. 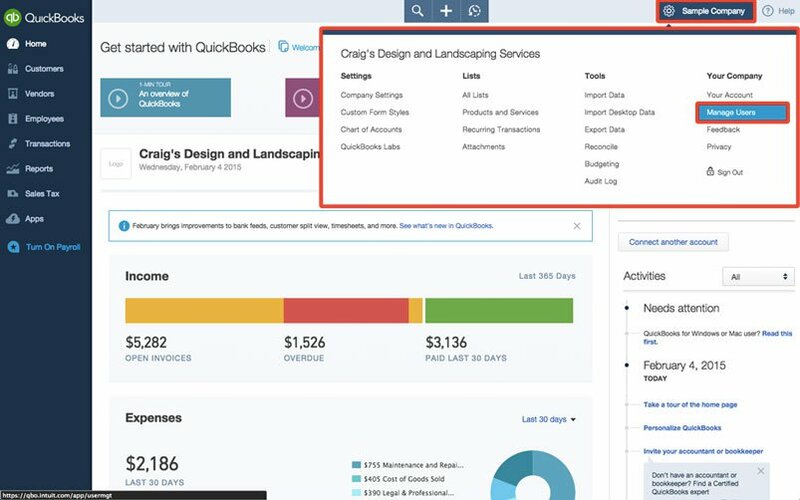 Now you’ll need to set your new user’s access rights to your QuickBooks. Choose Allto grant your new user unrestricted access rights to your QuickBooks. You can also choose None to restrict your new user’s access to your Quickbooks — users with no access rights can’t access any of the accounting features of QuickBooks, but they can fill out their own time sheets and manage other services your company subscribes. You can also choose Limited if you want to specify a combination of limited access rights. For example, let’s say you want your new user to only have access to the Customers and Sales sections of your QuickBooks, but not your Vendors and Purchases. To achieve this, select Limited under user access rights and check the box marked Customers and Sales. Once your User Access Rights are set the way you want them, click Next in the bottom right of the screen. Next you’ll need to set what administrative rights your new user will have to your QuickBooks company file. You can set your new user’s administrative rights so that they can view the Manage Users tab, but cannot add users, delete users or change access rights. To do this, select the button next to the View Manage Users under the user management options. Finally, you can set your new user’s access to Subscription and billing information for your QuickBooks account. Select No if you don’t want to grant your new user administrative rights to subscribe to new services, unsubscribe from old ones, or be able to change how you’re billed for QuickBooks Online. Once you have your new user’s administrative rights all set the way you want, click Next in the lower right corner to proceed. Click Finish and you’re done. Your new user will get an email with a link to your QuickBooks. They’ll need to create a login name and password unless they’ve used QuickBooks before.